Since Roger had bought some beautiful eggplants, he had a great recipe in mind. While we were going through all the ingredients, I was skeptical when he told me he wanted to add Gorgonzola cheese to this recipe. Don’t get me wrong, I do like Gorgonzola, it is just that my Italian “foodie – microchip” was sending me error signals. In Italy, Gorgonzola cheese is widely used during winter, and there are fantastic winter recipes of Gorgonzola with risotto, polenta, and – of course – pasta. I personally love whole grain crostini with Gorgonzola and pears or Gorgonzola with honey and nuts. However, in this recipe I wanted the eggplant to be the star, so adding Gorgonzola would have cancelled out its taste (it is like having Madonna and Lady Gaga on stage at the same time). Since it was a summer recipe, we decided to add fresh ingredients such as tomatoes, lemon zest, fresh tarragon and basil. Also, since we were in France, we used delicious crème fraîche. 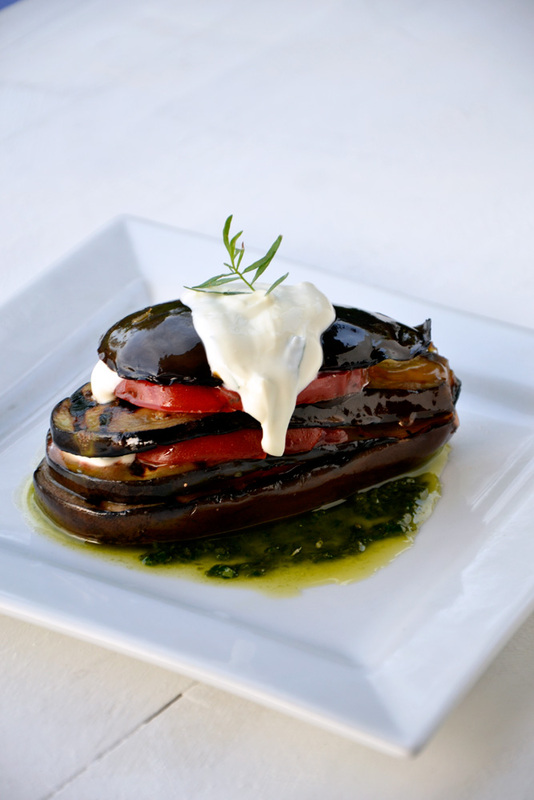 Eggplants stacks, fresh tomatoes and crème fraîche with a basil garlic sauce. Slice eggplants lengthwise into 5 slices. Keep only one of the tips since we are using only 4 slices per eggplant. Salt eggplants and leave for 1 hour. Meanwhile season tomato slices with extra virgin olive oil, lemon zest, garlic slices, and salt and pepper. Leave for an hour. Discard garlic. Dip in olive oil and chargrill on both sides until soft, and then transfer to a dish. In this phase, it is important to group together the slices belonging to each eggplant for plating purposes. Combine tarragon leaves with crème fraîche. To serve, place a spoonful or two of the basil garlic sauce onto each plate. Arrange the bottom slice of an eggplant on top. Add a tomato slice on top. Add a teaspoon of crème fraîche. Continue layering until you place the tip of the lengthwise-cut eggplant. Add two teaspoons of crème fraîche. Garnish with a basil or a tarragon leaf. Stunning recipe and stunning photo…who took it?! And did you have a good time? Hola CHICA!!! Thanks!! It was me with Roger’s coaching of course!! Yes we had a good time. I love Brits!!! This looks wonderful and it’s a great photo too. I wouldn’t have thought of combining basil and tarragon in the same dish – I’ll have to try it. I’m looking forward to the next course! Thank you! I love mixing different kinds of herbs into summer dishes. Tarragon is probably my favorite herb but for some reason it is difficult to get it in Rome! Merci teacher!! I am flattered! This is one amazing photo and one amazing eggplant dish! I LOVE eggplant and the simplicity of it is awesome! Creme fraiche is so unexpected, but I really like the idea! Go for it!!! and let me know hoe it goes!! Welcome home and a well done! Both picture and recipe are wonderful. And I, too, love crostini with gorgonzola and honey. It’s the interplay of the salty with the sweet that I find so appealing. I hope you had a nice trip home and I cannot wait to read of your visit. Thank you you are so sweet!!! Of course I don’t mind, I will be honored if you tried this recipe!!! Thank you!! That sounds fantastic. Lady Gaga and Madonna on one stage! OK, seriously, this has me drooling. Love that you stuck to your eggplant guns. Just a beautiful dish! wouldn’t that be so awesome – Madonna and Lady Gaga on one stage? In this post, Madonna is my eggplant though!!!! Well, your photography class certainly paid off because this pic is BEAUTIFUL!! A snapshot of summer goodness, really! Thank you!!! Summer summer!! I am already missing it!! Beautiful, beautiful photograph and wonderful recipe! Amazing recipe and STUNNING picture.. Thank you!!! Coming from you, I feel honored. Thanks for stopping by! Thank you! Eggplants and tomatoes are a great pair!! Adding lemon zest gave the dish an even fresher taste!